Smart prepaid offers a complete promo that gives you call, text, data and social media app access for only 20 pesos. The AOC20 is not a new code, but it is part of the All Out Surf package called ALLOUT20. It gives you unlimited text to all networks that you can use to contact anyone without worrying what SIM card they are using. Another plus is the 20 minutes call to Smart, Talk N text and Sun Cellular gives the you second options of communication. You also have internet access when you subscribe to AOC20 as it includes 150MB of consumable data and free access to Facebook for the whole day. No need for you to connect Wi-Fi network when you avail this promo. Just turn on your mobile data or use the SIM on your Pocket Wi-Fi then you are good to browse on the internet. 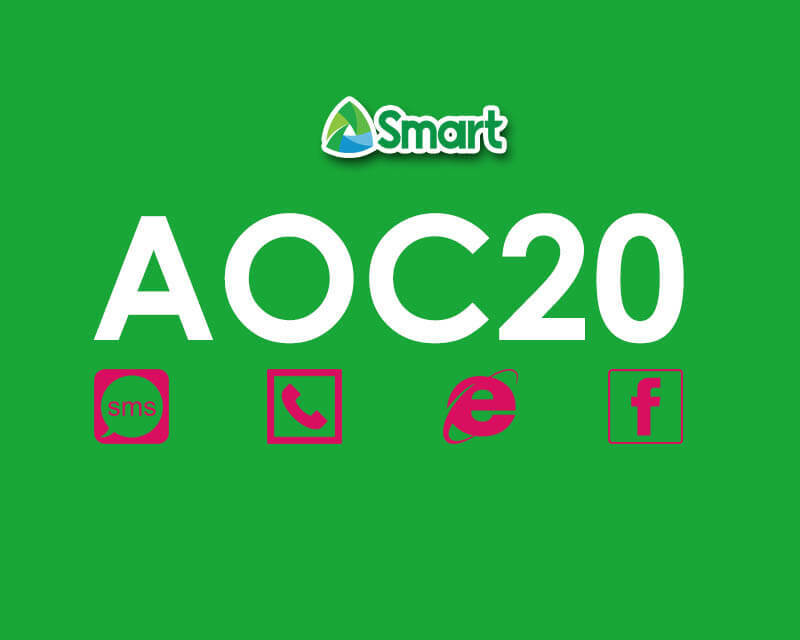 To subscribe AOC20, you need 20 pesos airtime load or balance on your account then text the keyword. Text AOC20 send to 9999 or use the keyword ALLOUT20. You call all also check other denomination All Out Promos with longer validity, more data, extended minutes call and other added additional bundles. How to call using this promo? You can call by dialing the 11-digit mobile number of the person you are trying to contact. Example: 09198765432. To use the allocated data, you need to turn on your mobile data option on your phone then open your browser. Go to the address bar and start typing your favorite website URL to check if your internet is working. You should see H+, E, G, 4G/LTE icon on your notification bar usually located at the top of your phone screen. You need to worry if you want to check your data balance, Smart with notify you how much MB and call minutes is left on your AOC20 promo.